Music education has improved with the help of numerous institutions. Today Bangalore has become a hub for national and international music schools. Karnataka plays an important role in the scene of Indian classical music with both Carnatic and Hindustani styles. The word ‘Karnataka’ doesn’t only mean the State of Karnataka. It also means Carnatic Music as a performing art form. Many Padma Bhushan and Padma Vibhushan award winners and celebrated Carnatic and Hindustani musicians like Basavaraja Rajaguru, Gangubai Hangal, Sawai Gandharva and several others hail from Karnataka. In the recent years umpteen musicians and students have come down to Bangalore from various places with a common dream of sharing and acquiring the knowledge of music. Today there are dozens of music institutions in Bangalore that are dedicated to contributing to the progress or growth and supporting Indian Classical and Western Music. 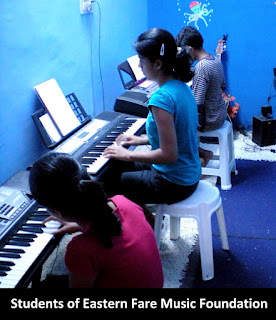 Out of those, the Bangalore School of Music in RT Nagar, Eastern Fare Music Foundation in Koramangala, Sumadhura Education and Cultural Trust in Vijaynagar, Shreepada Sangeeta Kala Kendra in Bannerghatta Road, World Music Centre in Malleswaram, are but a few who are helping the beginner and advanced level students by offering them assistance and professional knowledge in both Western and Indian classical music. With the courses offered by these institutions a student can sit for different examinations as well as participate in the commercial field of music. A few of these schools take assignments to elevate artists by giving them a platform to help establish their careers as professional musicians. Institutions like Bangalore School of Music and Eastern Fare Music Foundation conduct different shows every year for their students, who get a chance to showcase their talents. Many of these institutions are run by widely known and esteemed musicians themselves. Behind the World Music Centre are noted musicians Gopi (drummer and percussionist) and the singer Sangeetha Srikishen. The founder of the Sumadhura Education and Cultural Trust is prominent vocalist Suchethan Rangaswamy. The man behind the Eastern Fare Music Foundation is Jim Ankan Deka, a music composer, who has become the first Assamese to start a music institution and a production house in Bangalore. With the increasing number of students in the field of music education, in the coming years there will be a bigger demand and hope for these institutions.